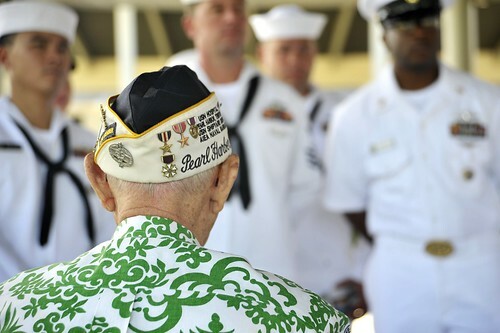 PEARL HARBOR, Hawaii - In a few weeks we will welcome hundreds of Pearl Harbor survivors and other World War II veterans back to Hawaii. Those veterans, along with their families, will be here to remember and honor their shipmates. As you know, Dec. 7, 2016 is the 75th anniversary of the attack on Oahu that propelled the United States into the Second World War. It is our sacred privilege to commemorate that historic milestone. For months, in coordination with Gov. Ige’s 75th Commemoration Committee, the National Park Service and many other stakeholders, we have been planning events in and around Joint Base Pearl Harbor-Hickam. The Navy and National Park Service’s cornerstone event, of course, is the Pearl Harbor Remembrance Day ceremony at Kilo Pier. The ceremony will begin at 7:55 a.m., the exact time the attack started on Pearl Harbor 75 years ago. Unlike recent years, seating is very limited at Kilo Pier this year. However, we will livestream the event so everyone will have the opportunity to witness the ceremony online or at the Pearl Harbor Visitor Center. (We will publish more soon at https://pearlharbor75thanniversary.com/). Our attending WWII veterans are in their 90s or in some cases over 100. Many tell us this will likely be their last time to visit. In planning, my top priorities for this event are to provide access to as many Pearl Harbor survivors and WWII veterans and their loved ones as we can, and to ensure the ceremony is as special and meaningful—and as safe—as it can be. We look forward to sharing the ceremony with the rest of the world online. Let’s reflect on this coming opportunity as we consider our recent Veterans Day and prepare for a meaningful Thanksgiving with family, friends and shipmates. To our tough and resilient veterans, past and present—and to those who never made it home—we owe our deepest gratitude as we honor the past to inspire the future. Fuller is commander of Navy Region Hawaii and Naval Surface Group Middle Pacific.